Soundtrack will include new remasters of both CPS-1 and CPS-2 versions of the arcade game, extracted directly from the arcade boards. Digital format available as of November 24th, as a pre-order bonus or to buy individually. A limited number of 91 copies including a postcard signed by original composer Yoko Shimomura were also available for 85 USD. 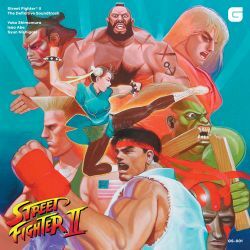 USgamer: " Street Fighter II: The Definitive Soundtrack Review: Cap-com-mand Performance"